?? 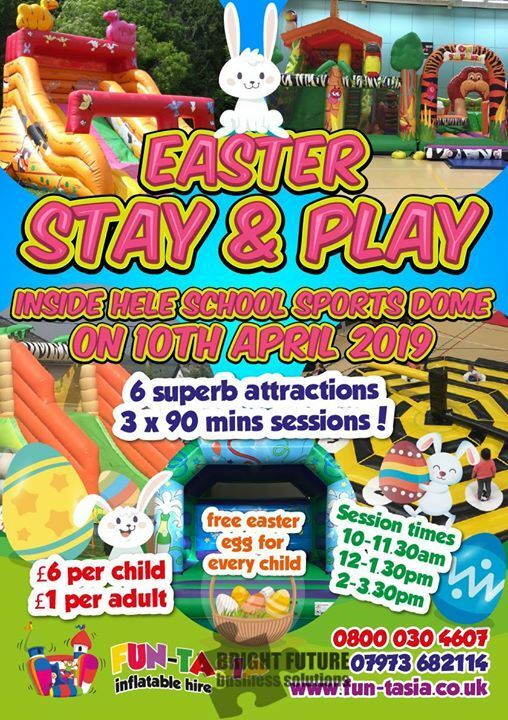 Our second Stay & Play event during Easter will be inside the Dome at Hele School which is a brand new venue for us on 10th APRIL 2019! 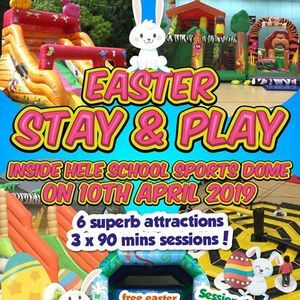 There will be 6 AMAZING ATTRACTIONS on site along with an EASTER BUNNY giving free easter eggs to all the children! The event is perfect for ages 2-12 and the cost is £6 per child, £1 per adult. Session times are 10-11.30, 12-1.30 & 2-3.30pm. PLEASE NOTE THAT TICKETS CAN ONLY BE PURCHASED FROM FUN-TASIA AND NOT AT THE THE LIFE CENTRE RECEPTION! There is a maximum of 80 children per session for health & safety reasons and you can prebook tickets or find out more info on the event itself by contacting us via FB, text or call 07817 903652. ? ?